If you are feeling bloated, have puffy eyes, a scattered mind, or unexplainable fatigue you may want to consider detoxing. Most of us have several toxins taking up precious space in our bodies. If you are a nursing mother or have any type of illness or disease please consult a health professional before beginning the detox process. When you begin a detox you should prepare your body mentally and physically. Start by eliminating alcohol, cigarettes, coffee, and sugar. Also, it is a good idea to minimize all toxic house cleaners and shampoos. Replace them with alternative, natural products with no harsh chemicals. The final step in the detoxing process, before you choose to method is to begin a yoga and meditation regiment to help ease your mind and rid your body of unwanted stress. There are different ways to meditate and it’s best to chose the one that works best for you. One type of meditation is mindful-meditation which a person focuses on breathing and one focal point. The other type is called open-monitoring mediation. This is when you observe all the things going on around you without any reaction. Both types of meditation help relieve stress, reduce anxiety and enhance creativity. 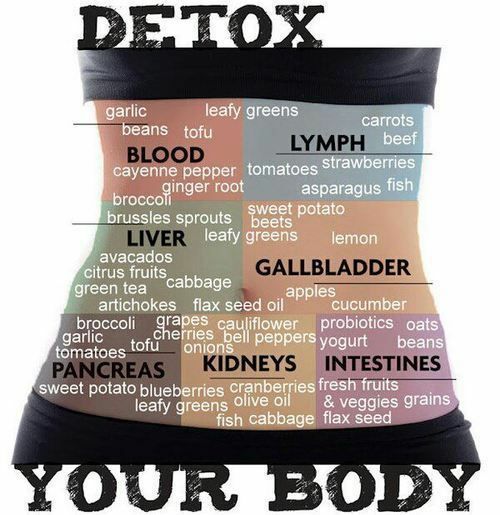 But which method of detox is best for me? There many different ways you can go about detoxifying your mind and body. Below are a few ideas of how you can go about getting rid of all those nasty toxins! According to the Mayo Clinic men should drink 3 quartz (13 cups) of water a day and women should consume about 2.2 quartz (9 cups) a day. Try out these three detox drink ideas you can make from home. Saunas are great for helping you sweat all those heavy metal toxins in your body. While in the sauna exfoliate your skin to help promote circulation using a dry brush and essential oils. Just don’t stay in any sauna longer than 30 minutes as it could be a health risk. One of the best methods to detox is by moving your body and exercising. One of my favorites is hot yoga. It is basically yoga but in 110 degree heat and it’s amazing. It’s light on your body, unless running which is rough on your knees and joints. I do suggest drinking plenty of water before hand and bringing an extra towel with you to your next session. Deeply inhale fresh air into your lungs and allow it to circulate throughout your body. This will help ease tension and create a relaxing feeling from head to toe. There are many natural supplements and teas out there to help support your body detox. NOW is one brand that I recommend because many of the products are blends so you get a combination of herbs and natural goodies into one serving. They come in a capsule form and are easy to consume with water. If you are looking for a good tea while detoxing I recommend Traditional Medicinals. If you are not familiar with this alternative method of detox therapy it helps with aches and pains, insomnia, colds, headaches, as well as improves skin tone. This is a practice you can do from home and here’s how. 1. Fill up the bath with hot water. After half an hour drain some water out and add cold water to the bath. Always finish with cold water. Alternate 3 times then dry off and lay down somewhere comfortable. Feel free to use essential oils or Epsom salt. 2. Use the same technique as above in the shower. Alternate temperatures as I described before and if you have a luffa if you have one. With all the pollution, dirt and dust that you breathe in everyday using a Neti Pot to flush out your nasal passages will help you sleep better. After using a Neti Pot you should feel less pressure built up in your noggin. Eating healthy foods that promote detoxification such as ginger, beets, avocados, asparagus, garlic, green tea, and wheat grass help cleanse your body and mind. This is a very important ingredient in living a healthy and balanced life.